What is Ignoring Gravity about? Why is it called Ignoring Gravity? Five questions doesn’t look like a lot, my earlier draft versions had a lot more. But a few practice sessions recording my Q&A sessions on my camera lasted more than five minutes. Far too long, judging by author interviews I watched on You Tube. My aim was two minutes. The final versions were 2.30 [interior] and 2.35 [exterior]. I didn’t write a script, I simply prepared by deciding the most important things I wanted to say about my book. 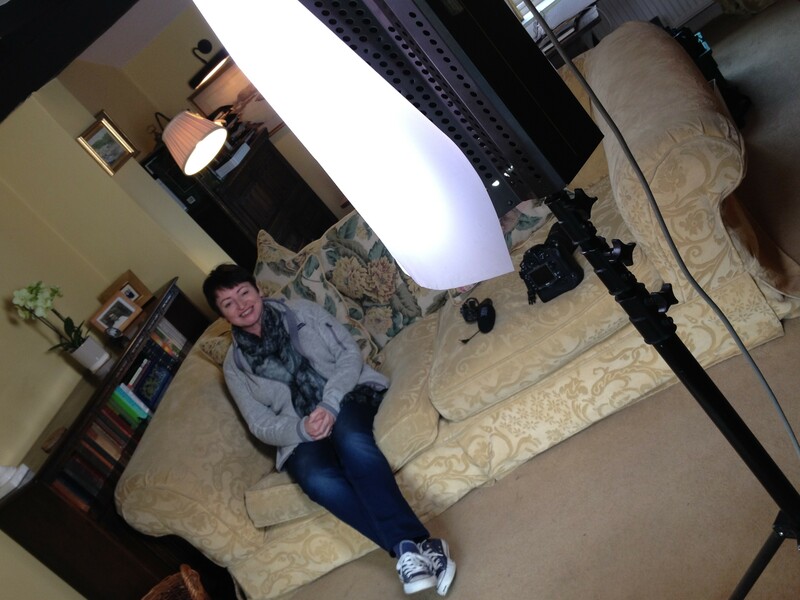 Marketing manager Nicky Stephen had ear-marked the location for the interview at our first meeting. “I’ve got the perfect location,” she said. And it was perfect: a huge tree in a beautiful garden, with a circular tree seat for me to sit on. Perfect, because it tied in with the imagery in the book and the cover design we were already planning. 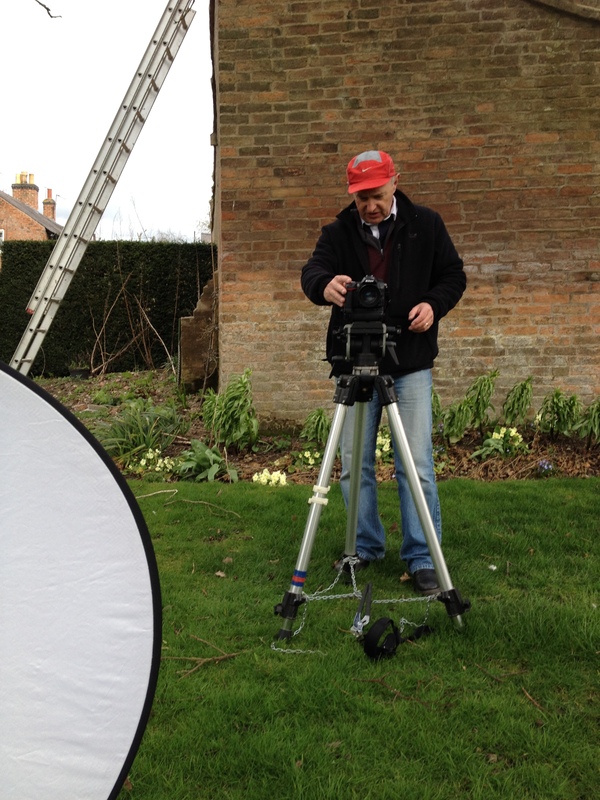 Film producer Simon Cooper decided where to position his cameras, there were two. Unfortunately the sky darkened, the clouds scowled. We forged ahead, determined the location was perfect. The sheep which were lambing in the next field, whose bleating we had worried overnight would be too loud for the backing track, proved not to be a problem for sound director Ich Mowatt. The problem… was the rain. And the cold. We shot so many takes because I fumbled my words, I was shivering so much that Nicky covered my legs in a blanket and coats. Eventually, to my relief, Simon said ‘Shall we try indoors? The thought of repeating the process was scary, but the prospect of a warm kitchen and a mug of tea made the decision for us. As we walked back through the village, the rain started in earnest. 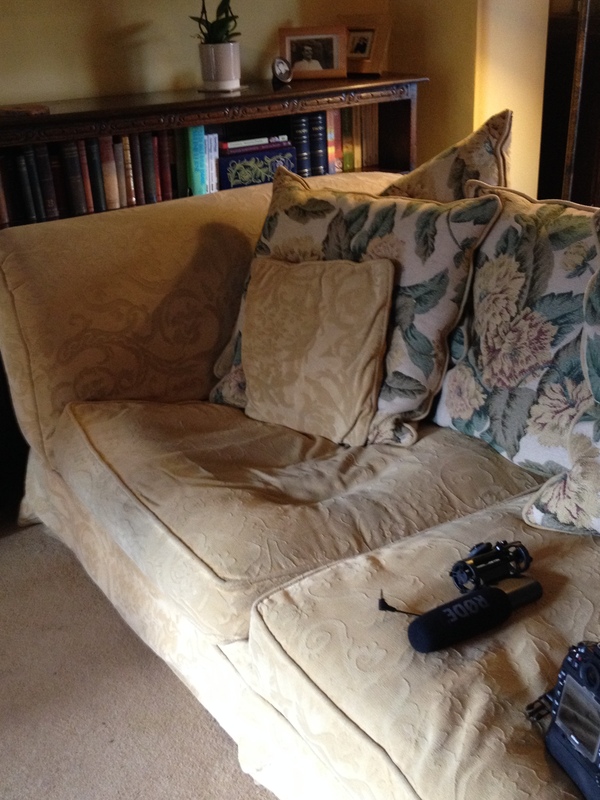 A comfy sofa awaited, the second version of the interview was film quickly. We all regretted the loss of the exterior location, but were resigned. The footage was unusable… the rain on the lens, my shivering, my clenched shoulders and chattering teeth, my fluffed lines, ‘ands’ and ‘buts’ which made Simon’s editing job impossible. So here are the two versions. Please like the videos on You Tube and share amongst your friends, and leave me a message here to tell me which video you prefer! To watch the cold, windy, exterior version, click here. To watch the warm and cosy interior version, click here. To find out more about Nicky Stephen Marketing, click here. To check out other work by Simon Cooper Media Production, click here. Read what other readers are saying about Ignoring Gravity. I like the indoors one Sandra just because you seem a lot more comfortable in that one – probably because you weren’t freezing! Both versions are great. I agree that you seem more relaxed indoors. Therefore, my choice is obviously the indoors video. I love that as well. Both videos might attract different readers. I love the outdoor one for nature/weather. I love the indoor one for the feeling of home. Perhaps you seem nearer to the story in the outdoors.